Cardiff City Football Forum | Cardiff City FC Messageboard • View topic - UPDATED " CARDIFF CITY PREMIER SEASON FIXTURES 2018-19 "
" CARDIFF CITY PREMIER LEAGUE & PRE-SEASON FIXTURES 2018-19 "
Sat Aug 11 - AFC Bournemouth 2 Cardiff City 0 Crowd 10,353 Away Support(1,211).
" CARDIFF CITY PROMOTED TO THE PREMIER LEAGUE "
Cardiff City's away average will be 23rd out of 24 clubs in the Championship. Saturday 6 Aug 2016, 3pm - Birmingham City 0 Cardiff City 0 Crowd 19,833 Away( 1,803 ). Wed 20th July RW Ahlen v Cardiff City Due to bad weather/bad pitch Cancelled. Cardiff City 22nd out of 24 Clubs with an average of 748 fans and City's final League position was a comfortable 8th. 18/08/2015 Blackburn Rovers 1 Cardiff City 1 Crowd 12,025 Away( 211). 22/08/2015 Cardiff City 2 Wolverhampton 0 Crowd 14,820 Away( 1,030). 25/08/2015 MK Dons 2 Cardiff City 1 Cup/2nd rd Crowd 5,617 Away(340). 29/08/2015 Nottingham Forest 1 Cardiff City 2 Crowd 18,762 Away( 679). 26/10/2015 Cardiff City 0 Bristol City 0 Crowd 15,287 Away(944). 12/12/2015 Cardiff City 2 Sheffield Wednesday 2 Crowd 14,526 Away(1,500 approx). 15/12/2015 Cardiff City 3 Brentford 2 Crowd 12,279 Away( 320 ). 18/12/2015 Birmingham City 1 Cardiff City 0 Crowd 14,414 Away( 655). 26/12/2015 Milton Keynes Dons 2 Cardiff City 1 Crowd 12,510 Away( 1,050). 29/12/2015 Cardiff City 1 Nottingham Forest 1 Crowd 15,461 Away(895). 02/04/2016 Cardiff City 2 Derby County 1 Crowd 28,680 Away ( 1,620 ). 05/04/2016 Burnley 0 Cardiff City 0 Crowd1 5,740 Away(277 ).
" CARDIFF CITY'S FIXTURES 2015-16 SEASON FRIENDLIES "
Isabel Blu. Born a blue, always a blue! Wednesday 13th August Cup 1st rd Coventry City 1 v Cardiff City 2 Crowd 1,382 Away Support (359). Saturday 16th Aug Cardiff City 3 v Huddersfield Town 1 Crowd 20,749 Away Support(614). Tuesday 19th Aug Cardiff City 1 Wigan Athletic 0 Crowd 20,662 Away Support(276). Saturday 23rd Aug 3pm Wolves 1 Cardiff City 0 Crowd 21,221 Away Support(1,650 ). Saturday 30th Aug Fulham 1 Cardiff City 1 Hmm. Crowd 17,508 Away Support( 2,950). 13 Sat Cardiff City 2 Norwich City 4 Crowd 21,746 Away Support( 890 ). 16 Tues Cardiff City 0 Middlesbrough 1 Crowd 19,711 Away Support( 420 ). 20 Sat Derby County 2 Cardiff City 2 Crowd 27,251 Away( 1,508 ). Tuesday 23rd Capitol one Cup 3rd rd. Cardiff City 0 Bournemouth 3 Crowd 6,491 Away (355). 27 Sat Cardiff City 2 Sheffield Wednesday 1 Crowd 20,901 Away(1,400). 30 Tues Brighton 1 Cardiff City 1 Crowd 23,712 Away (422). 3rd October Friday Blackpool 1 Cardiff City 0 Crowd 10,502 Away(762). 18th Saturday Cardiff City 2 Nott's Forest 1 Crowd 21,263 Away(1,280). 21st Tuesday Cardiff City 3 Ipswich Town 1 Crowd 20,919 Away(576). 25 Millwall 1 Cardiff City 0 Crowd 10,135 Away(786). 1 Cardiff City 3 Leeds United 1 Crowd (24,022) away (2,010). 4 Bolton 3 Cardiff City 0 Crowd 12,961 away( 375). 8 Birmingham 0 Cardiff City 0 Crowd 15,950 Away(2,004). Friday 21st Cardiff City 2 Reading 1 Crowd 20,643 Away(852). 29 Watford 0 Cardiff City 1 Crowd 15,668 Away( 1,035). Sat 6th Cardiff City 0 Rotherham 0 Crowd 20,419 Away(450). 13 Bournemouth 5 Cardiff City 3 Crowd 10,440 Away(1,360). 20 Cardiff City 2 Brentford 3 crowd 21,784 Away(over 1,350). 26 Charlton 1 Cardiff City 1 Crowd(17,543) Away(850). 28 Cardiff City 2 Watford 4 Crowd(22,208) Away1,350). Friday 2nd FACUP 3rd Rd Cardiff City 3 Colchester 1 Crowd(4,194) Away(247). 10 City back in BLUE Cardiff City 1 Fulham 0 Crowd(22,515) Away (400). 17 Norwich City 3 Cardiff City 2 Crowd( 25,995 ) Away( 450). Tues 20 Middlesbrough 2 Cardiff City1 Crowd (16,035) Away(149). 24 FACUP 4th Rd Cardiff City 1 Reading 2 Crowd(11,750) Away(1,826). 31 Cardiff City 0 Derby County 2 Crowd( 22,287 ) Away( 1,890). 7 Sheffield Wednesday 1 Cardiff City 1 Crowd(22,445) Away(994). 10 Cardiff City 0 Brighton 0 Crowd(19,206) Away(380). Now Tues 17 Cardiff City 1 Blackburn 1 Crowd(19,057) Away(260). 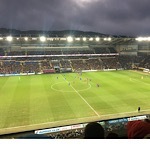 21 Huddersfield Town 0 Cardiff City 0. Crowd( 12,798) Away(450). 24 Wigan 0 Cardiff City 1 Crowd(10,016) Away (300). 28 Cardiff City 0 Wolves 1 ( 21,165) Away(2,000). 3 Rotherham 1 Cardiff City 2 Crowd ( 8,534) Away(396). 7 Cardiff City 1 Charlton 2 Crowd(20,488) Away(950). 14 Brentford 1 Cardiff City 2 Crowd(11,217) Away(1,500). 17 Cardiff City 1 Bournemouth 1 Crowd (19,819) Away (1,200 ). 21 Cardiff City 2 Birmingham City 0 Crowd (20,602) Away (1,582). 4 Reading 1 Cardiff City 1 Crowd(17,953)Away(1,659 ). 6 Cardiff City 0 Bolton 3 Crowd(20,219 ) Away(500 ). 11 Leeds 1 Cardiff City 2 Crowd(22,401) No Away Support. 18 Cardiff City 0 Millwall 0 Crowd 19,639 Away(250). 17/08/2013	15:00 West Ham 2 Cardiff City 0 . Crowd 34,975. Away Support (2,975). 25/08/2013	16:00	Cardiff City 3 Man City 2 . Crowd 27,068. Away Support (2,546). 27/08/2013 19:45 Accrington Stanley 0 Cardiff City 2 Cup Crowd 1,617. Away Support (444). 31/08/2013	15:00	Cardiff City 0 Everton 0 Crowd 27,344. Away Support (2,613). 14/09/2013	15:00	Hull City 1 Cardiff City 1 Crowd 21,949. Away Support (1,268). 22/09/2013	16:00 Cardiff City 0 Tottenham Hotspur 1 Crowd 27,815 Away Support( 2,386). 24/09/2013 19:45 West Ham 3 Cardiff C 2 Cup Crowd 18,611 Away Support(291). 28/09/2013	15:00	Fulham 1 Cardiff City 2 Crowd 23,020 Away Support(3,598). 05/10/2013	15:00	Cardiff City 1 Newcastle United 2 Crowd 27,538 Away Support (1,806). 19/10/2013	15:00	Chelsea 4 Cardiff City 1 Crowd 41,475 Away Support (1,364). 26/10/2013	15:00	Norwich City 0 Cardiff City 0 Crowd 26,846 Away Support ((1,491). 14/12/2013	15:00	Cardiff City 1 WBA 0 Crowd 26,632 Away Support (1,845). 21/12/2013	12:45	Liverpool 3 Cardiff City 1 Crowd 44,621 Away Support(2,930). 26/12/2013	15:00	Cardiff City 0 Southampton 3 Crowd 27,929 Away Support( 2,600). 28/12/2013	17:30	Cardiff City 2 Sunderland 2 Crowd 27,247 Away Support(1,620). 01/01/2014	15:00	Arsenal 2 Cardiff City 0 Crowd 60,004. Away Support(2,945). 04/01/2014 15.00 Newcastle United 1 Cardiff City 2 FA CUP 3rd Rd Crowd 31,166 Away Support(395). 25/01/2014 15:00 Bolton W 0 Cardiff City 1 FA CUP 4th Rd Crowd 12,750 Away (Support(1,390). 28/01/2014	19:45	Manchester United 2 Cardiff City 0 Hmm Crowd 75,303 Away Support( 3,123) . 01/02/2014	15:00	Cardiff City 2 Norwich City 1 Crowd 26,748 Away Support(1,424). 08/02/2014	17.30	Swansea City 3 Cardiff City 0 Crowd 20,402 Away Support(1,632). 11/02/2014	19:45	Cardiff City 0 Aston Villa 0 Hmm Crowd 27,597 Away Support( 2,250). 15/02/2014 15:00 Cardiff City 1 Wigan Athletic 2 Crowd 17,123 Away Support(1,484). 22/02/2014	15:00	Cardiff City 0 Hull City 4 Crowd 26.167 Away Support(800). 02/03/2014	16:30	Tottenham 1 Cardiff City 0 Crowd (35,512) Away Support (1,983). 08/03/2014	15:00	Cardiff City 3 Fulham 1 Crowd (26,796) Away Support (1,541). 15/03/2014	15:00	Everton 2 Cardiff City 1 Crowd( 38,018) Away Support(2,425). 22/03/2014	15:00	Cardiff City 3 Liverpool 6 Crowd( 28,018) Away Support(2,704). 29/03/2014	15:00	West Bromwich Albion 3 Cardiff City 3 Hmm Crowd(25,661) Away Support(2,642). 05/04/2014	15:00	Cardiff City 0 Crystal Palace 3 Crowd( 27,687) Away Support(2,200). 12/04/2014	15:00	Southampton 0 Cardiff City 1 Crowd(30,526) Away Support(2,404). 19/04/2014	15:00	Cardiff City 1 Stoke City 1 Hmm no good Crowd( 27,686 ) Away Support(2,111). 27/04/2014	12pm Sunderland 4 Cardiff City 0 Crowd. Crowd( 42,397 ) Away Support ( 1,279). 03/05/2014	15:00	Newcastle United 3 Cardiff City 0 Crowd (50,239) Away Support(1,120). 11/05/2014	15:00	Cardiff City 1 Chelsea 2 Crowd(27,716) Away Support(2,502). The Football League, or the brainless EFL rebrand, have today released the key dates for the coming 2016/17 season. With Cardiff City's Play Off hopes are still alive albeit very slim, it's time to turn attentions to next season and fans will be hoping some Championship dates are still replaced with the Premier League version. With 2015/16 almost at a close, promotions, relegations and play off spots almost confirmed, the EFL have confirmed that the new rebranded pyramid will kick off the new season on the weekend of Saturday August 6. Following the opening day fixtures, the League Cup will take priority in the week beginning August 8 and for those it applies to, Round 1 of the League Trophy will take place in the week beginning August 29. For the festive period, games will be held on Boxing Day, New Year's Eve and Monday January 2. The League Cup Semi Finals have been set for January, and the final will be on Sunday February 26 2017, with the League Trophy Final on Sunday April 2 2017. The final games of the calendar season will be on Saturday May 6 2017. The FA Cup takes place on Saturday May 27 2017, so the Play Off Finals for all three divisions will be split over the two weekend's surrounding it. League One takes Saturday May 20. League Two takes Sunday May 28 and the Championship Play Off will be on Monday May 29. Changes to Bristol City & Forest clashes..
We can confirm that two of our October fixtures have been moved in accordance with the EFL so as to be broadcast live on Sky Sports. Meanwhile, our trip to Nottingham Forest – originally scheduled to kick-off at 3pm on Saturday, 22nd October – will now kick off at 5.30pm on the same day. Post-Cornwall, the Bluebirds will play two more friendly fixtures prior to the 2017/18 season kicking off on Saturday, August 5th. The first of these is to be finalised, but is set to be played away from home on Tuesday, 25th July. The second – and final pre-season friendly is already confirmed: a home fixture with Portsmouth at Cardiff City Stadium on Friday, 28th July (7pm). Re: " CARDIFF CITY CHAMPIONSHIP FIXTURES 2017-18 AND "
The Bluebirds will now face Bristol City at the earlier time of 12pm on Saturday, 4th November 2017.
is the derby game on sky tonight ? Re: " CARDIFF CITY'S PROMOTION SEASON 2017-18 SEASON "
" CHAMPIONSHIP HOME AVERAGE ATTENDANCES 2017-18 "
Onto the Home averages well Aston Villa were 1st with a cracking 32,101, Leeds finished 2nd on 31,525 and Wolves in 3rd on 28,302. 13 of the 24 clubs averaged above 20k including away fans and only one club ended under five figures. Burton obviously were the club averaging under five figures with a 4,645 average, they were joined in the bottom 3 by Brentford and Millwall.
" CARDIFF CITY PROMTED TO THEIR PREMIER LEAGUE 2017-18 "
Re: " CARDIFF CITY SEASON 2018-19 SEASON PRE-SEASON GAMES "
Do we have a friendly away to Wealdstone FC or will there be one arranged as part of the Ciaron Brown deal earlier this year.